Neon creates its own fantasy world. I think that electric glow carries its own magic. Certainly draws your eye. Recently the NYT did a piece about one of the few remaining neon shops in NY, Let There Be Neon. The shop was founded by Rudi Stern who used to do neon shows for the psychadelic guru Timothy Leary. There's an homage to Stern on their web site and a nice slide show of some of their stuff. But many say neon is no longer a sign of the times. No longer a city's defining moment - Tokyo, Las Vegas and Times Square not withstanding. But there's another side of neon beyond the prosaic. 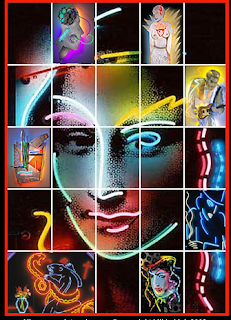 There's the work of inventive neon sculptor Lili Lackich, long known by her signature piece, MONA, originally created for the Museum of Neon Art. Her work is displayed in her book, Neon Lovers Glow in the Dark available on her website. Her website is a fascination in itself. And a great reminder that artists help us see the world through a different lens.